Have you been wondering how to become a security dealer or reseller? Maybe you have been scouring the internet looking for the best deal on CCTV equipment so that you can still make a profit on the actual products you will be selling or installing for your clients. Look no further, Techpro Security Products is here to help! We have been working hard for many years now to bring you all of the proper tools and assistance you would need to grow your business and become successful. Even if you have just begun selling surveillance systems or access control, We provide all of our customers with everything they would need in order to begin a CCTV Installation or Security Dealer company. 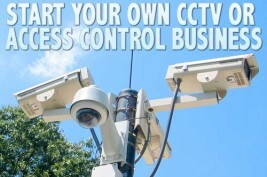 In order to get started you will need to have a CCTV, Security, or Installation company. Basically, as long as you’re running a business that has to do with our field, you would be eligible for our program. If your business is already registered through your state, head on over to our CCTV Distributor/Reseller Application to begin the sign up process. The information you list on our reseller form is for us to verify that the company exists and belongs to the person signing up for an account. We take this very seriously because we do our best to protect our current dealers. If just anyone was able to sign up and buy or sell our products at lower prices, then why would anyone want to purchase our surveillance or access control systems at retail price. We also have a policy in place that does not allow for any techpro security employees to disclose any reseller pricing information unless you are a verified dealer with an active account. If you, as a dealer, decides to make your prices higher than retail, you have every right to do so. But just think what would happen if one of your customers found out that you got a big discount, a lot less than retail pricing, but are trying to sell them a product at double the price. This would lead to potential to lose a customer, or worse, end up having to give a refund and uninstall a whole system from a location. After signing up, using the form I linked above, please be patient and give us 1-2 business days to go over the application and decide whether or not we are able to approve you according to our policies. Once you have been approved for your new techpro dealer account, you will receive an email from us letting you know that you have been approved along with a link to our reseller-only site. This website is locked behind password protection for the same reasons I listed above. Most distributors do not want their customers to look up the product online and feel like they were cheated. Many companies operate different and some have higher overhead than others. In turn, they must charge a little more for their product especially if they are offering multiple free services for their customers. Logging in to our reseller site will give full access to your dealer pricing and many other resources that we’ve set up in order to help you make even more sales. Remember, we profit from your success as well, so we love to assist our dealers with just about anything they need to make sure that they are extremely happy with our services. In case you’re wondering, “Can’t our customers just look up the model number of the cameras?” The answer is, “YES!”, of course they can! However, we do also offer an OEM program that will allow you to label our products with your own model numbers or skus and we can even print your company logo on the sticker. 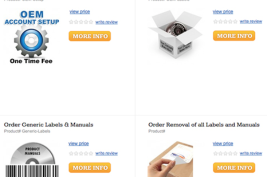 Our OEM site is set up so that you can specify the items you would like labeled along with the information needed on the stickers. The way it works is that you would place your regular order for your customer on our website. Once you have all of the products in the shopping cart, you can go to the OEM category in our website menu and choose which products you would like labeled as well as how many. There is a setup fee for the first time you place an OEM order since we have to have our employees create you initial sticker design. This means that next time you come back to our site to place an order you will already have the design made and we will have stored it in our system for future use. You can then avoid paying the setup fee once again unless you are purchasing a new product type that requires a different format of labels. You will have the opportunity to log into your OEM account and create your own product Skus so that when a customer goes online and researches that model number, your website will come up instead of ours. 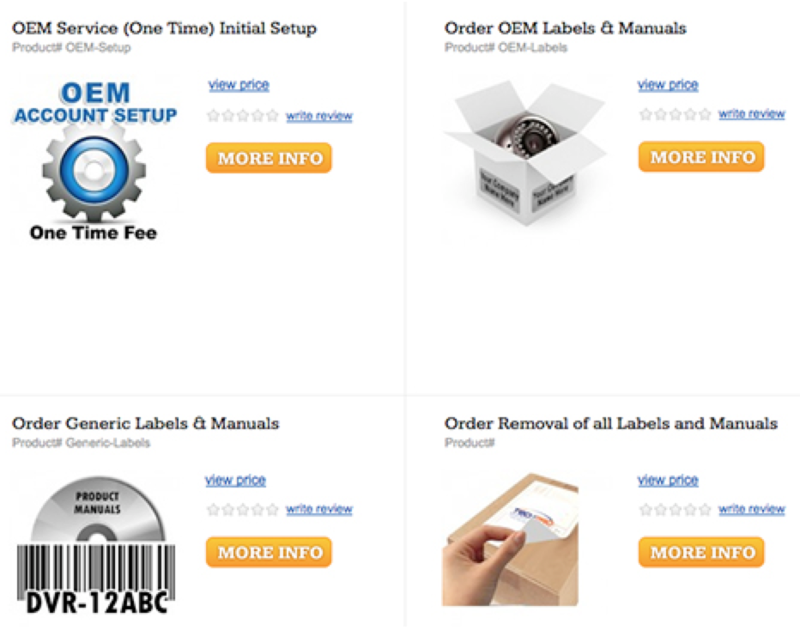 If you want to avoid all of this, your OEM account also has the option for you to purchase label removals. We will have our guys remove the stickers from our cameras so that they carry no direct identification on the products themselves. This allows for some dealers to have their own labels printed, or they may install the cameras for their customers this way if they’d like. In the end, you will end up being provided with all of the tools you would need in order to grow your CCTV or Access Control business into a successful one. We carry a large variety of access control products now as well and can help you get started with that technology as well. For those of you who don’t know about Access Control but it’s name, it simply stands for products that give you access to certain places. Such as having a door that will only open with a key card or key chain key fob. Or maybe you’d like to put a button to buzz people in and our of a location. These products can be a very nice addition to your security product arsenal. If for some reason you get confused or have any questions, please feel free to contact us and we will be sure to provide you with the proper information to help you move forward. We are now open from 9am-8pmEST and you can call us at: 866.573.8878. We also have many other options for you to get a hold of us. We also offer a live chat, Contact Us form, an online forum, and a support request ticket system. This will greatly benefit you since we offer free tech support on the life of the product for all dealers!